The Wells Fargo officer in charge of policing the division that created millions of fake accounts has been replaced. Claudia Russ Anderson began a six-month leave of absence as the retail bank's chief risk officer in June, a Wells Fargo (WFC) spokeswoman told CNNMoney on Monday. She has been replaced by Vic Albrecht, a 35-year veteran of the company. As chief risk officer, Russ Anderson was charged with safeguarding Wells Fargo's retail bank from illegal activities. Earlier this month, Wells Fargo was accused by regulators of creating more than two million fake bank and credit card accounts. Even though executives on leave typically plan to return, Russ Anderson would have to apply for a different position "if she were to decide to come back to the company," a spokeswoman for Wells Fargo said. 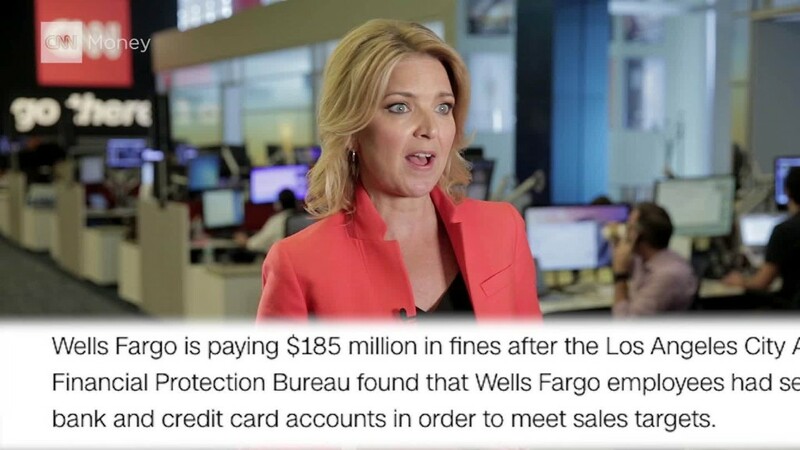 Wells Fargo wouldn't say whether her leave and replacement were tied to the fake accounts scandal. "All I can share is that it was a personal decision to take a leave of absence," the spokeswoman said. The timing will certainly raise eyebrows. Russ Anderson's leave of absence was announced internally at the bank in June. Just weeks later, Wells Fargo also announced the retirement of Carrie Tolstedt, head of community banking, the division at the heart of the massive scandal. Tolstedt's departure has created a firestorm because the longtime Wells Fargo executive is set to walk away with an incredible $124 million in stocks, options and restricted shares. Russ Anderson's leave of absence was reported earlier by Bloomberg. Wells Fargo revealed the leave of absence just a day before CEO John Stumpf is set to be publicly grilled by Elizabeth Warren and her colleagues on the Senate Banking Committee.